BackgroundDevelopment of the enteric nervous system (ENS) requires interactions between migrating neural crest cells and the nascent gastrointestinal tract that are dependent upon genes expressed by both cell compartments. Hlx, a homeobox transcription factor gene that is expressed in mouse intestinal and hepatic mesenchyme, is required for normal embryonic growth of intestine and liver, and the Hlx-/- genotype is embryonic lethal. We hypothesized that Hlx is required for ENS development.ResultsEnteric neurons were identified in Hlx+/+ and Hlx-/- mouse embryos by immunostaining of embryo sections for the neural markers PGP9.5 and Phox2b, or by staining for β-galactosidase in whole-mount embryos containing the dopamine β-hydroxylase-nLacZ transgene. In Hlx+/+ embryos, neural crest cells/enteric neurons have moved from the stomach into the intestine by E10.5. 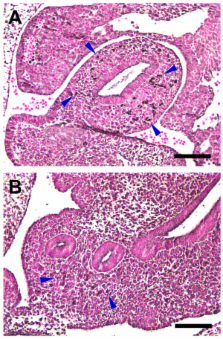 By contrast, neural crest cells/enteric neurons remain largely restricted to the lateral stomach mesenchyme of Hlx-/- embryos, with only a few scattered neural crest cells/enteric neurons in the intestine between E10.5–16.5.ConclusionThe Hlx homeobox transcription factor is required for early aspects of ENS development. The homeobox gene Phox2b is essential for the development of autonomic neural crest derivatives. The sympathetic, parasympathetic and enteric ganglia are the main components of the peripheral autonomic nervous system, and are all derived from the neural crest. The factors needed for these structures to develop include the transcription factor Mash1, the glial-derived neurotrophic factor GNDF and its receptor subunits, and the neuregulin signalling system, each of which is essential for the differentiation and survival of subsets of autonomic neurons. Here we show that all autonomic ganglia fail to form properly and degenerate in mice lacking the homeodomain transcription factor Phox2b, as do the three cranial sensory ganglia that are part of the autonomic reflex circuits. In the anlagen of the enteric nervous system and the sympathetic ganglia, Phox2b is needed for the expression of the GDNF-receptor subunit Ret and for maintaining Mash1 expression. Mutant ganglionic anlagen also fail to switch on the genes that encode two enzymes needed for the biosynthesis of the neurotransmitter noradrenaline, dopamine-beta-hydroxylase and tyrosine hydroxylase, demonstrating that Phox2b regulates the noradrenergic phenotype in vertebrates. Mammalian achaete-scute homolog 1 is required for the early development of olfactory and autonomic neurons. The mouse Mash-1 gene, like its Drosophila homologs of the achaete-scute complex (AS-C), encodes a transcription factor expressed in neural precursors. We created a null allele of this gene by homologous recombination in embryonic stem cells. Mice homozygous for the mutation die at birth with apparent breathing and feeding defects. The brain and spinal cord of the mutants appear normal, but their olfactory epithelium and sympathetic, parasympathetic, and enteric ganglia are severely affected. In the olfactory epithelium, neuronal progenitors die at an early stage, whereas the nonneuronal supporting cells are present. In sympathetic ganglia, the mutation arrests the development of neuronal precursors, preventing the generation of sympathetic neurons, but does not affect glial precursor cells. These observations suggest that Mash-1, like its Drosophila homologs of the AS-C, controls a basic operation in development of neuronal progenitors in distinct neural lineages. Copyright statement: Copyright © 2006 Bates et al; licensee BioMed Central Ltd.
Nkx2-9 is a novel homeobox transcription factor which demarcates ventral domains in the developing mouse CNS. RGMa inhibits neurite outgrowth of neuronal progenitors from murine enteric nervous system via the neogenin receptor in vitro.